Saddle Peak Lodge is located in Calabasas, in the middle of the hills not far from Malibu. 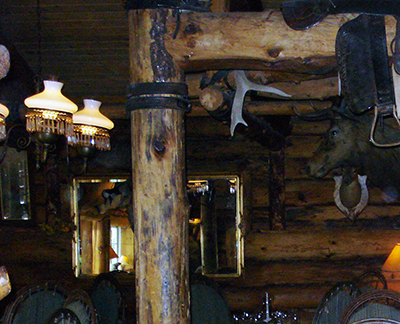 The restaurant has a very nice hunting lodge decor and is very comfortable. They have very affordable valet parking in front of the restaurant ($3.5 plus tip). Service was very good. Our waiters made genuine efforts to please us. They moved the table to make us more comfortable and were kind to accomodate while we were waiting for the other guests to arrive (about 45mns, you should know that you can’t predict traffic in Los Angeles). I started with the chilled heirloom tomato gaspacho. 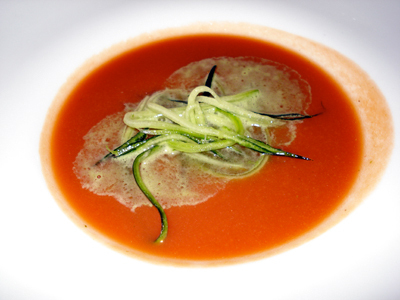 The gaspacho was served with cilantro and cucumber slaw. The texture was extremely smooth and the taste was perfect. It was an excellent interpretation of the classic recipe. As main course, I had the roast beef sandwich. 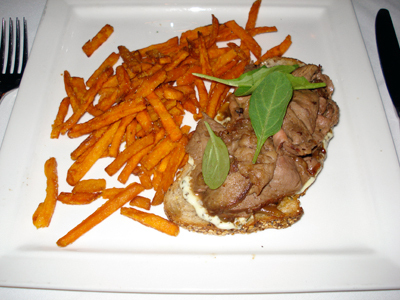 The roast beef (prime angus) sandwich was served open face with caramelized onions, tomatoes, watercress, arugula, lemon rosemary aioli and sweet potato fries. The beef, very tender and well complemented by the onions, was extremely tasty. The fries, perfectly cooked (crispy outside and tender inside without being oily), were a good complement. While the dish itself is not very original, it was very well excuted and had a nice twist. 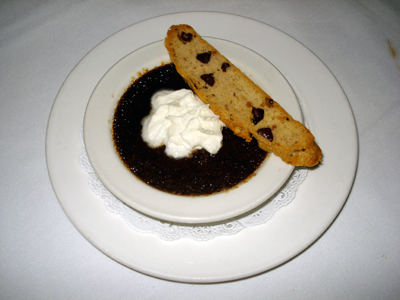 For dessert, I had the Cappuccino style coffee creme brulee with home made biscotti. I am a big fan of creme brulee and this one was a bit disappointing. The top of the creme was not properly carmelized and the biscotti was not dry enough to be crackling as it should. Fortunatly, while it was more on the chocolate than the cappucino side, the overall taste was excellent. Around $90, including drinks (mimosa, a bottle of white wine shared between the 5 of us and coffee) and tip. Considering the restaurant, considering the service and considering that it was father’s day (Celebrations are always more expensive), Saddle Peak Lodge definitly offers good value for money. I will go back.